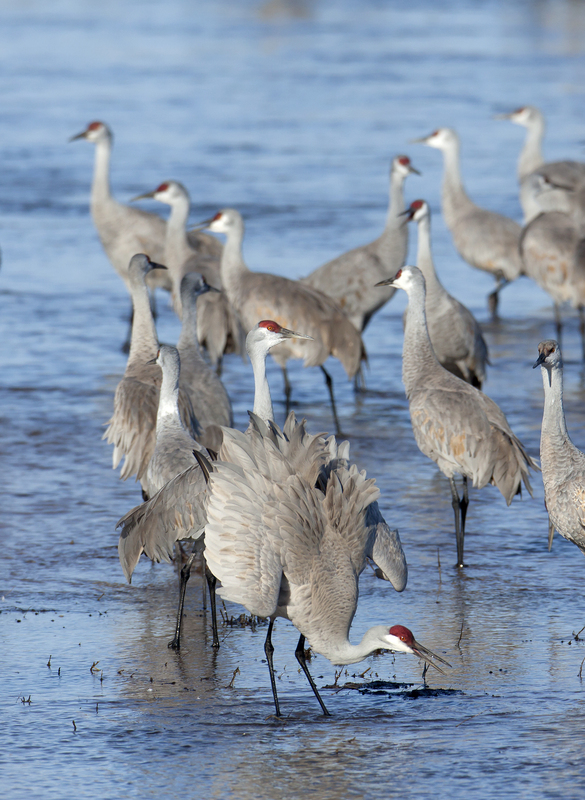 The Platte River is a critical stopover for Sandhill Cranes during spring migration. 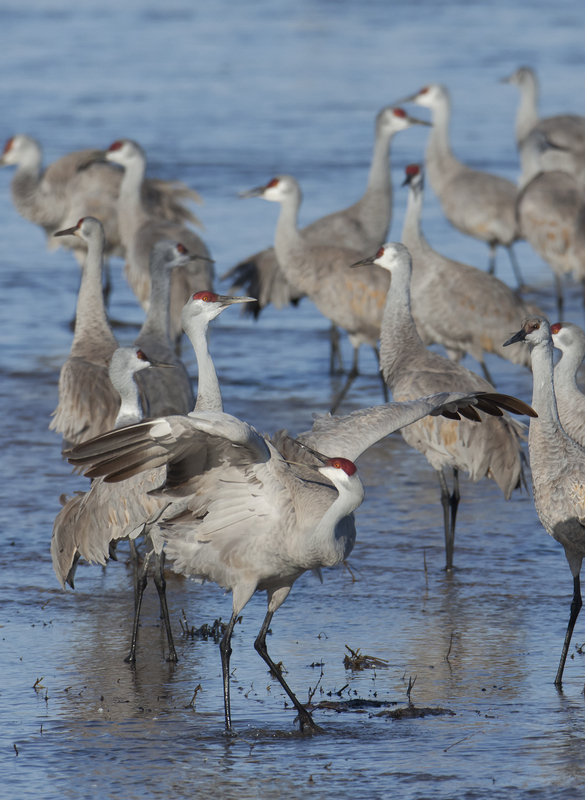 Roughly 80% of the world population of Sandhills – about 500,000 – use this area between mid February and mid March. The stretch of river that remains useful for this species, and millions of other waterfowl, is shrinking as water is diverted for agriculture and development. Climate change to more extreme weather patterns of drought and floods give invasive woody plants the opportunity to become established in the already shallow water and turn once safe sandbar roosts to inhospitable islands of vegetation. In Grand Island, NE, the Crane Trust is working hard to preserve the natural habitat along the Platte River for both of North America’s cranes – the abundant Sandhill Cranes, and the world’s rarest Whooping Cranes who also rely on this waterway during their 2500 mile migration to Wood Buffalo National Park in Canada. Photo by Ted Thousand, ©2014 – all rights reserved. 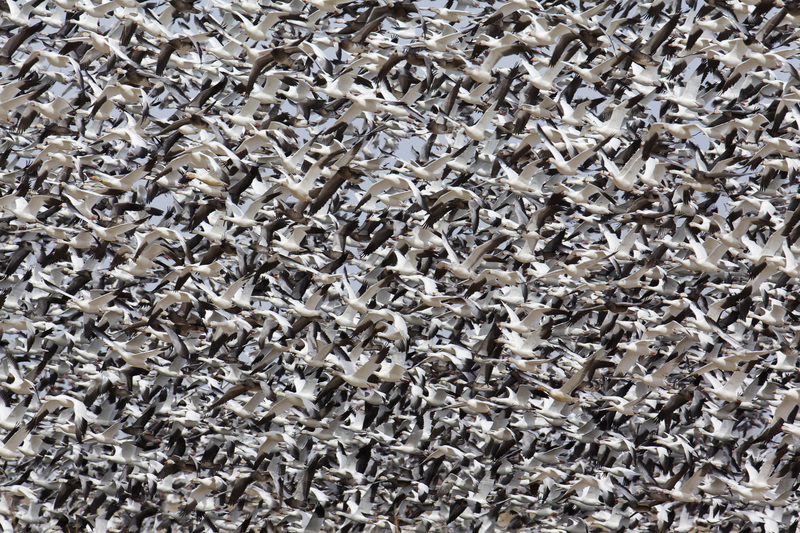 In addition to the 500,000 Sandhill Cranes migrating in the western flyway and stopping along a 30-mile or so stretch of Nebraska’s Platte River are more than 2 million snow geese. Can you spot the odd goose out? Nutritious meals during the day and safety among the cranes at night provide the perfect spot for waterfowl to rest and feed as they work their way toward nesting grounds in the tundra. Geese float among the long legs of the cranes, secure in the knowledge that their fellow travelers will alert them to potential dangers lurking in the night. They will continue on their migration earlier than the cranes, leaving the bigger birds to clean up any remaining waste grain in the farmer’s fields. Click on the photo for a larger image – Photo by Ted Thousand ©2014. All Rights Reserved.